This is a traditional belief inherited from family, to have the scholar dishes eaten on the first day (or second) of school. Method for Dish 11) Cut tofu into chunk cubes. Gently pat-dry tofu with kitchen towel/ paper. 2) Heat wok with oil over high-medium fire. Add tofu and sauté till lightly crisped and browned. Remove from wok and drain on kitchen towel. Set aside. 3) Discard excessive oil and leave just a little of it. Add garlic and stir-fry till fragrant and lightly browned. Reduce heat to medium fire, and then, return tofu to wok. Add chicken stock (or water), and simmer for 2 – 3 minutes. Then, add white pepper, light soy sauce, oyster sauce, and sugar. Gently stir-fry to mix well. Taste check. If prefer more briny taste (especially if using water instead of broth), add pinch of salt. Otherwise, omit it. 4) Add scallion into the wok. Stir-fry a little together with the rest of the ingredients. Then, pour in cornstarch slurry and gently stir-fry to thicken the sauce. Dish up and serve. 1) Bring a pot of water to a boil over high heat. Heat off when boiled. Place cleaned pig’s liver slices on a strainer, and then, plunge liver in the hot water on the strainer, for 10 – 20 seconds. Shift the strainer occasionally to have the liver blanched more evenly. Drain and set aside. 2) Heat wok with sesame oil over high fire. Add garlic and ginger, stir fry till fragrant. Reduce heat to medium-low fire, add scallion adn stir-fry a little. Then, return pig’s liver to wok, and immediately drizzle Hua Diao rice wine. Then, quickly add in dark soy sauce, light soy sauce, oyster sauce and sugar, stir fry quickly (to retain moisture and tenderness) to mix well. Dish up and serve with hot steamed rice. A decent portion of dish 1, the Stir-fried Tofu & Spring Onion, counts about 100kcal. 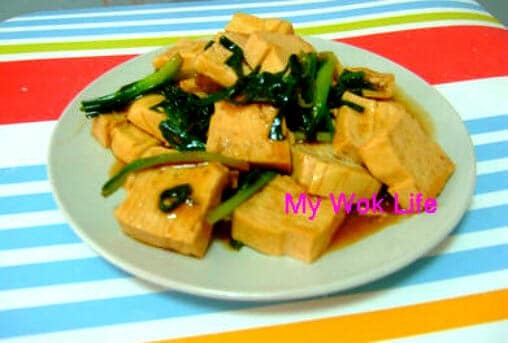 Mild briny taste of the tofu dish, it is never too sinful to eat more. Sautéed version counts about 180kcal. 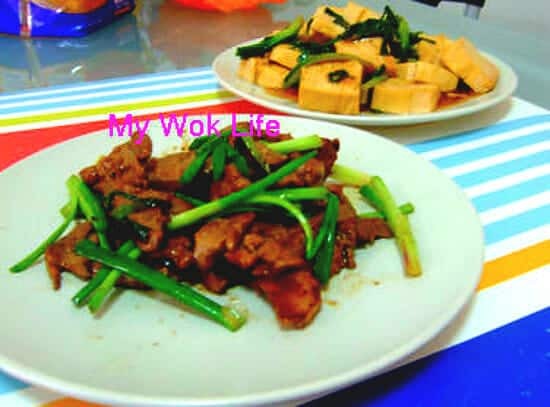 As for dish 2, simply a dish of Stir-fried Pig’s liver with Scallion/ Spring Onion and Ginger in Dark Sauce, it counts about 270kcal. Taste of this dish was robust and aromatic. Tips: Do not blanch the pig’s liver for too long to avoid hardening. You have to also cook the liver quickly in order to retain its moisture and tenderness. 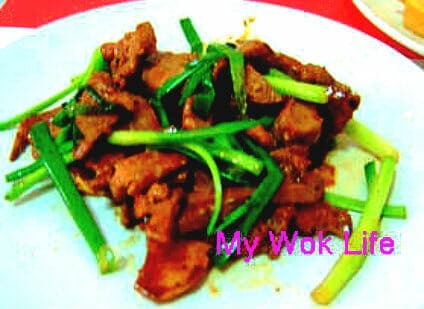 * If find it too dry in the wok half-way cooking the pig’s liver dish, you may drizzle some water to moist it. * Use the whole stalk of scallion including the whitish part, just need to trim away the sandy roots part.